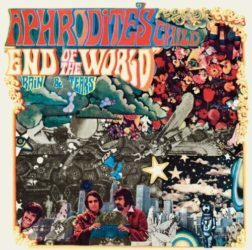 End of the World is the debut album by Greek progressive rock band Aphrodite’s Child. With their single hit “Rain And Tears” they took their first step in becoming a big act in Europe. By reaching international audiences this classic got some more attention. It’s one of those lost gems of ’60s psychedelic rock. The original compositions are recognisable by the use of the mellotron and Demis Roussoss his voice. This brilliant example of how Greek influences blended with British psychedelic music made of them a unique band. Even some European pop ballads fits well on this versatile album. Vangelis is at his best when he’s shining on his keyboards and let the melodies drifting away in their songs.